The 2019 Kia Sportage is a compact SUV that competes with the Toyota RAV4, Honda CR-V and Hyundai Tucson. The Sportage is one of four crossovers offered by Kia: larger than the Niro and smaller than the Sorento and upcoming Telluride. Since its complete redesign for the 2017 model year, the Sportage has been mostly unchanged since then. This year, the Technology Package is no longer available for LX trim, which means that no advanced safety features can be added at the base level. The EX trim now comes standard with blind-spot monitors and rear cross-traffic alerts, and all models come with Kia’s 10-year, 100,000-mile powertrain warranty. The 2019 Sportage LX has a starting price of $24,795 including a $1,045 destination charge. The Sportage SX Turbo has a starting price of $34,145 including the $1,045 destination fee. The 2018 Sportage had a starting price of $24,645 including the $1,045 destination charge. The 2019 Kia Sportage is available in three trims: LX, EX and SX Turbo. 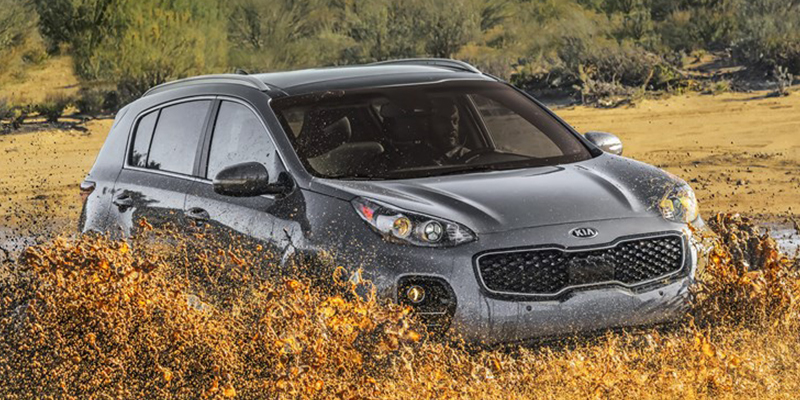 The Kia Sportage has a wheelbase of 105.1 inches, an overall length of 176.4 inches and a width of 73.0 inches. The Sportage comes standard with a 2.4-liter four-cylinder engine that has 181 horsepower and 175 pound-feet of torque. The Sportage SX Turbo comes with a 2.0-liter turbocharged four-cylinder engine that has 240 horsepower (237 with all-wheel drive) and 260 pound-feet of torque. A six-speed automatic transmission is standard for all models. When equipped with optional trailer brakes, the Sportage can tow up to 2,000 pounds. When equipped with front-wheel drive, the Sportage LX has EPA-estimated fuel economy ratings of 23 mpg in city driving, 30 mpg on the highway and 26 mpg combined. With all-wheel drive, fuel economy ratings are 21 mpg city, 25 mpg highway and 22 mpg combined. When equipped with front-wheel drive, the Sportage EX has EPA-estimated fuel economy ratings of 22 mpg in the city, 29 mpg on the highway and 25 mpg combined. With all-wheel drive, fuel economy ratings are 21 mpg city, 25 mpg highway and 23 mpg combined. When equipped with front-wheel, the Sportage SX Turbo has EPA-estimated fuel economy ratings of 21 mpg in city driving, 26 mpg on the highway and 23 mpg combined. With all-wheel drive, fuel economy ratings are 20 mpg city, 23 mpg highway and 21 mpg combined. The 2019 Sportage comes standard with a backup camera, an impact-sensing door-unlocking system, downhill brake control and hill-start assist. Sportage EX models come standard with blind- spot monitors, lane- change assist and rear cross-traffic alerts. Sportage SX Turbo models come standard with autonomous emergency braking with pedestrian detection, lane- departure alerts, front and rear parking sensors and hig- beam assist. These features are optional for EX trim. The 2019 Sportage comes standard with a 5-inch touch screen display that includes six-speaker audio, USB and auxiliary audio inputs, steering wheel-mounted controls and Bluetooth connectivity. Sportage EX models come with a 7-inch touch screen that includes satellite radio and Apple CarPlay/Android Auto. Sportage SX Turbo models come with an 8-inch touch screen system that includes navigation and Harman Kardon premium eight-speaker sound. These features are optional for EX trim. The Sportage comes standard with power windows and door locks, remote keyless entry, cloth seating, folding rear seats and manual front seat adjustments. The Sportage EX comes with leather upholstery, a 10-way power-adjustable driver’s seat, heated front seats, leather-wrapped steering wheel and shift knob and gloss black interior trim pieces. The Sportage SX Turbo comes with an eight-way power-adjustable passenger seat, ventilated front seats and a flat-bottom steering wheel. Editor’s note: All photos courtesy of Kia.